Bird Baths are a wonderful way to view birds in your backyard. A fresh water source will attract more species of birds than bird feeders or birdhouses alone. Water also helps create critical pockets of wildlife-friendly habitat where urban sprawl has taken over the natural landscape. 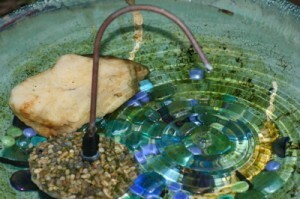 You can make your own bird bath rather quickly and inexpensively should you be feeling a little “crafty”. This great article from Birds and Blooms Magazine explains clearly and simply how to make a mosaic bird bath. With all materials listed, it gives concise, step-by-step directions for creating your own masterpiece. And not artwork to just lay around the house, but something to be used and enjoyed over the years by many feathered friends! 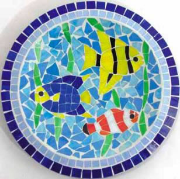 For whimsical designs and vibrant colors, nothing beats the artful designs displayed in mosaic bird baths. With rich hues that are available in many combinations, the choices are endless! Mosaic tiles are durable enough to withstand a birdbath heater in winter, and will not fade or discolor is summer heat. Glazed tiles also help to keep bath water cooler in sweltering summer temperatures. A pedestal bird bath creates a wonderful focal point in any yard, plus a fresh water source is the most effective way to attract more birds and keep them coming back. Creating a bird-friendly habitat is really quite simple by providing food, water and shelter. Bird houses, bird feeders and bird baths used together will ensure a greater variety of songbirds visiting your yard! Wild birds require a consistent fresh water source (year round) to properly preen feathers for optimal flight conditions. Some bird baths are actually too deep for birds to bathe and wade comfortably. The maximum depth of bath water should be no more than 3 inches. The mosaic bird bath above, is shallow and perfect for feathered friends to drink and bathe. If your bath has a deeper center, consider placing a large rock in it so birds can perch. In warmer weather, water tends to stay cooler and fresher longer if the bath is placed in the shade. In freezing winter months, place baths in full sun if possible. Mosaic, ceramic, copper, and glass birdbaths also have the capacity to hold a birdbath heater during frigid weather, a life saver for many birds during tough winter months. Adding color to your environment brings it to life! Whether planting annuals, or adding garden accents, a small burst of color will have a large impact. Functional art for your yard makes good sense, and birdbaths fit the bill. You can attract more feathered friends with a fresh water source, and frankly, the birds aren’t too choosey when it comes to bath designs. The only requirements are that the bath be clean, and water levels shallow enough for birds to bathe and wade comfortably. Optimal water depth is 2-3 inches-maximum. 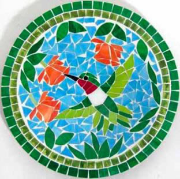 Mosaic Bird Baths are available in whimsical designs with fun, vibrant colors. One of the advantages of mosaics is they are able to accommodate a bath heater in winter, giving birds a year-round water source to count on in frigid weather. This is a critical time for wild birds as most natural water sources tend to freeze, leaving them unable to bathe and properly preen feathers. Moving water will entice and attract more wild birds to your yard! 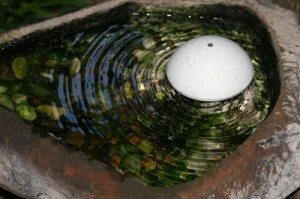 These days, several reasonably priced items that create moving water are available for you to add to a birdbath. We have an old mosaic bird bath that has a copper dripper in it, and birds flock to it! Hummingbirds can be seen bathing under the “drips” when larger birds aren’t around. Other easy ways of adding moving include water wigglers and leaf misters. 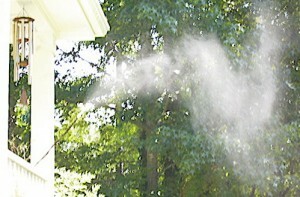 Butterflies and warblers enjoy the fine mist, and are seen daily at our two misters. The misters are versatile and can be used in a birdbath, staked in the ground, or hung from the deck or front porch, like we use ours. Add moving water to your habitat and watch the tremendous increase in wild bird species and their numbers. Another advantage of having moving water in your bird bath is that mosquitoes can not lay their eggs…just can’t happen in moving water. So now you’ve seen some moving water in our own yard, maybe that’s why bird food must be rationed…they eat us out of house and home! Hope you’ve gotten some aquatic ideas for your feathered friends too, they’ll surely appreciate it! Colorful, whimsical and totally functional, mosaic bird baths are a great choice when considering pedestal type birdbath. They have the ability to hold a bath heater during winter, giving you a year-round birdbath. Ceramic tile also helps keep water cooler in hot summer months. You can entice more birds in your yard with a fresh water source. Some birds who do not use birdhouses or visit feeders will frequent a bird bath. See a greater variety of wild birds with the addition of a birdbath. Several articles can be found on the internet with detailed instructions on making your own mosaic bird bath. This can be a time consuming project involving three to four good chunks of time, but well worth it. A mosaic bird bath can be a beautiful and functional piece of art for your landscape, that wild birds will love too! Mosaic Bird Baths for a Splash of Color! Add some color to your landscape with something other than flowers. Birdbaths are a great addition to any yard, as they create a focal point with form and color. Water is a great wild bird magnet too! Just sit and gaze at this oasis, you might find it can be quite addictive. 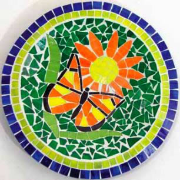 Mosaic Bird Baths add an extra splash of color and texture with their vibrant and whimsical designs. They have the ability to withstand a heater in freezing temperatures too. Wild birds love them too…and will hang around more if the bath is kept clean with fresh water. If you’d like to spruce up your backyard, try adding a beautiful mosaic bird bath as a focal point. These ceramic birdbaths are versatile as they are able to hold a heater in freezing winter months–a critical time for birds when most baths are rendered useless. Vibrant colors are available in many themes, like frogs, fish, butterflies and hummingbirds. They are easy to clean, and most have some type of insert from the stand to the bowl, thus securing it properly. Birds need water to drink and bathe as well. Feathers must be kept clean (preened) in order to work right. Shallow baths work best, or ones that have a walk-in or step-down approach for birds. A bird bath is a good investment for attracting birds, and one that will likely last a lifetime.